Istanbul, Turkey - October 2015: The first Ultra High Definition (4K) transmission in Turkey broadcast to the home consumer was successfully transmitted by TRT 4K in co-operation with Mediapro Turkey, Turksat and Samsung. 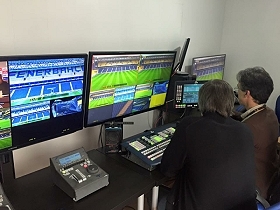 Seven Ultra HD cameras were used during the production of the UEFA Europa League A Group match between Fenerbahçe and Ajax. The broadcast was transmitted by the European Broadcasting Union (EBU) to Beinsport, BT Sports and Japanese NHK TV channels, and was also made available at UEFA's headquarters. Mediapro Turkey pioneered the important broadcast by using many technological advances in Turkey and Europe. Seven Ultra HD cameras, 4 EVS XT3, 72 channels video mixer and 4K broadcast compatible equipment were used in the production. The set up and the tests of the operation were done in three days. 25 Spanish team members and 15 local Mediapro Turkey team members took part in the production. In the broadcast with 50 FPS quality, the transmission to the end consumer was done via Turksat with 18 MHZ capacity. The H265 (HEVC) encoding method was used for encoding the Ultra HD footage. The Fenerbahçe vs Ajax 4K broadcast was a great advance and a first-time production in Europe, in which the signal was sent directly to the satellite instead of being sent via a fiber communication network and was made available to free-to-air viewers without any encryption or subscription requirements.TRT 4K, Samsung, Turksat and Mediapro Turkey's co-operation will continue with the production of a second UEFA match in 2015. Turksat General Manager Prof. Doctor Ensar Gül also emphasized the fact that Turksat pays great attention to satellite technologies, while Samsung Turkey CEO Yoonie Jong said Samsung wanted to be a market leader in 4K broadcast. Mediapro Turkey CEO Selahaddin Koyuncu expressed his happiness for introducing the latest technological advance in the broadcasting sector to Turkish people with a production that got full marks from international broadcasters.